The Gaede Family has been traced back quite a distance. Numerous members of our family have done extensive research. Most of the information can be found in the book "The Abraham B. Gaede Family" which was written by several cousins of mine on the Gaede Committee in 1977. Research continues today with several genealogists in the family. This will probably be one of the longest page on the website. *Johann Herman Gäde was born in Thorn, West Prussia 6-13-1784. Little information is known about his life in Prussia. He married Katharina Nikkel and owned a tavern. One day while he was trying to break up a brawl in the tavern, he stumbled and fell because of a crippled foot. In his anger he cursed his foot. Shortly after this incident, a son, Heinrich was born. When Johann saw that his son had two clubfeet, he felt it was a punishment from God for cursing his own foot. He warned his son never to curse his feet or to be angry with God for them. Because of economic conditions and because the Mennonites were under pressure to join the Prussian military, the family decided to move to South Russia where sixty German colonies already existed. In 1823 the family made the pilgrimage. Johann had to push a cart most of the way over rough and often rain-soaked roads. There was also danger from wild animals, thieves, and storms. The family settled in Liebenau (love meadow) in the Molotschna district in South Russia. Each homestead consisted of a house, a nearby stable, and five acres of land. *Heinrich Gaede was born near Thorn, West Prussia in 1815. Since he was born with two crippled feet it was necessary for him to make his own boots. Therefore, he learned the trade of cobbling shoes. Under his boots he wore two pairs of homemade woolen cloths wrapped around each foot. He had to wear them summer and winter otherwise he could not walk. His father reminded him again, never to curse his feet and he took the counsel to heart and never did so. He was thankful to God that none of his twelve children were born with the affliction. On December 14,1836, Heinrich married Agata Knelsen (Cornelsen) who was born in Grossweide, South Russia, in 1815. 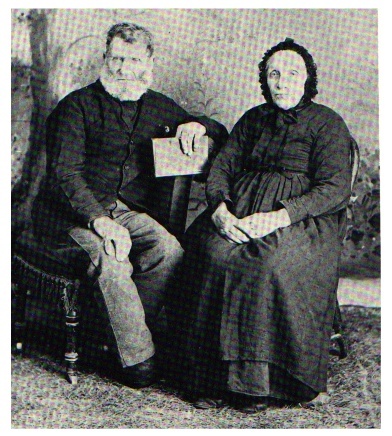 Her brother Abraham Knelsen was one of the founders of the Mennonite Church and was married to Heinrich's sister, Aganetha. In the early years of the marriage they were very poor. Heinrich was frequently ill and at one time was bed-ridden for an entire year. The mayor gave Agata a written permit and a horse and wagon so she could go from village to village to beg for grain to make bread. With a heavy heart and great difficulty she did this. Times began to get better and the villages began to acquire wealth. The family moved to the Taurin region in 1872. Johann, (my great great grandfather) Heinrich's oldest son died in Russia in 1870. 24 year old Marie died before the move and Heinrich Jr. who had married in the "old colony" stayed behind. They lived in Kuban for only six years before the Russian Government decided they should be like other Russians. Speak Russian, attend Russian schools, go into the military, or do some kind of forestry or hospital service. Many of the Mennonites did not want to do this, so they decided to go to America. The ocean voyage aboard the SS Leipzig was long and difficult for the parents and four of their children. 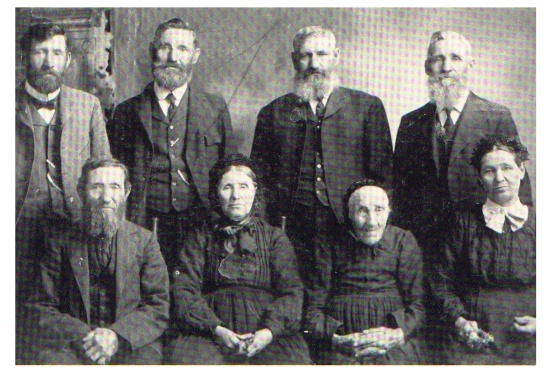 They settled near Hillsboro, Kansas and joined the Ebenfeld Mennonite Brethren Church. *Heinrich J. Gaede was raised by Johann & Sara Schmidt. They also had another foster child by the name of Elizabeth Goertz. On 8-27-1874, The Schmidt Family with their two charges came to America onboard the ship "Cimbria". They settled in Kansas. Henry was able to be in contact with the rest of the Gaede Family, which had also immigrated and was living in Kansas. Henry married Maria Epp, born: 11-30-1864 in Blumenort, Molotschna, So Russia. They were married on 12-4-1883 in Harvey County, Kansas. 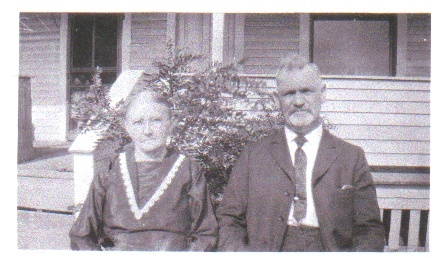 Henry, Marie, and their 6 children lived in Inman, Kansas. On September 16, 1893, Heinrich took part in the Cherokee Strip Run in Oklahoma and staked his claim to 160 acres. In 1895, Heinrich moved his family to this land. They made the trip in covered wagon together with 2 other families, one was his sister Agatha and her family. They had two cows tied on the back of the wagon so they would have milk on the way. While they were on their way, a big storm and rain came up. They drove their wagon into a gully for a little protection. Nearby lived a farmer and when he noticed them, he came to them and invited them to his house for shelter and supper. Afterwards, the farmer put hay on the floor for them to sleep that night. Heinrich always said he felt God had sent an angel to lead and protect them on that trip. Heinrich had great faith in God and taught his children this deep abiding love. Their first home in the new territory was a sod house made against a creek bank. They had not lived there very long when the river flooded and the banks overflowed and washed away their home and almost all their belongings. Heinrich and Marie hurriedly loaded the children in the covered wagon and went to stay with Heinrich’s sister until they could find somewhere else to live. A kind man from town sold him a one-room store building and gave him work to help him pay for it – how he rejoiced and thanked God for his blessing. As food was also hard to get in such a large family, they had to make everything count. Marie would cook watermelon juice until it was like syrup to spread on bread. Once when Heinrich went to the post office there was a letter with $10 from someone who had heard of his plight. Once again, the Lord had provided and the family thanked God for the blessing. After several years, the family moved to a farm 3 miles from Medford, Oklahoma. There they lived for many years. Heinrich soon helped to organize the Medford First Mennonite Church (Feb 1897) and on December 9, 1899, he was ordained as minister of the church. In 1916, they moved to Tucson, Arizona where he ministered in a Mennonite Community Church; and in 1925, they moved to Shafter, California, where Heinrich was also minister in Shafter's first Mennonite Church. (In the country on Nic Neufeld’s farm) The ministry in those days was a labor of love, as ministers were not paid a salary, so in all the years he preached (until he was about 65) he was never given any money. People would sometimes bring a chicken, eggs, or vegetables & fruit, for the family. Even though Marie had nearly lost her life several times (especially during the childbirth of some of her stillborn children) she stood by and helped Heinrich in every way she could. All visiting ministers and missionaries to the area stayed in their home. When their son Curt, became ill while working in Detroit, Michigan, Heinrich went and stayed with him for 7 weeks. During this time, Marie and the other 4 boys had to run the farm and even butcher 4 hogs. The family was poor, insofar as earthly goods were concerned, but they were a happy family. Their home was filled with much laughter. The family was very fond of music and spent much time singing and playing instruments. Henry & John played the violin, Curt the guitar, Jake the mandolin, George the ukulele, and Marie played the organ. Elizabeth and Bertha at this time, too young to play, but they remember the singing and good time. When the family would have one of their songfests, Marie would go to the phone and ring her own number. This was the signal for all others on the party line to lift up the receiver and listen to the music. I have a lot more information of the descendents and family members. I am going to stop here and if you would like to follow my family line click on the link for Carl Neumann and the story will continue. If you would like any further information or have any you would like to contribute, just email me. Special thanks to a distant cousin Paul Cornelsen for all the Gaede Family information. I owe you a big favor! Remember to Sign up for the GAEDE Mailing Lists!! !